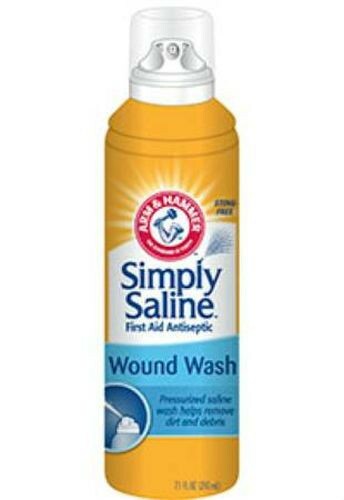 Arm and Hammer Simply Saline Wound Wash is a sterile solution designed to remove dirt, foreign material, and debris from wounds. 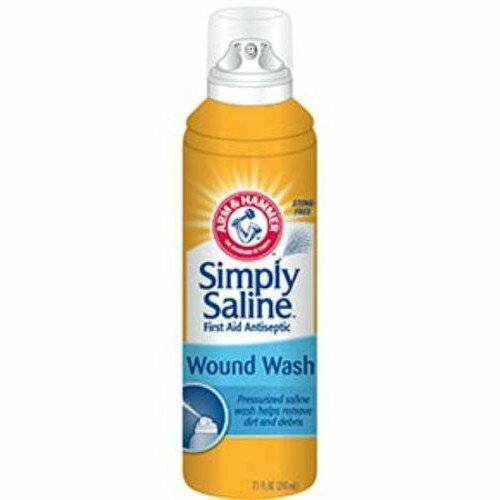 The Arm & Hammer Simply saline First Aid Antiseptic Wound Wash is a gentle formula that is highly effective, without causing stinging or burning. This saline solution promotes healing while remaining drug and preservative free. The contents of this sterile saline solution remain sterile throughout each use. Simply saline wound wash uses sterilization methods that are FDA regulated and meet the relevant international and national standards. Its active ingredients are sourced in the U.S. with a combination of water, sodium chloride, and baking soda. Vitality Medical offers a wide variety of Cleansers and Wounds Washes, on sale with fast shipping daily. What are the ingredients? Can you post a picture of that portion of the container please? Per the manufacturer, ingredients are as follows: Water, sodium chloride, sodium bicarbonate.